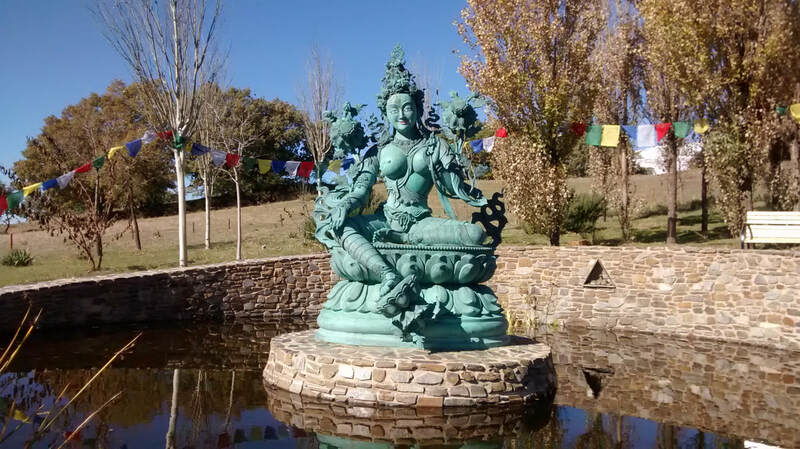 From O Sel Ling Buddhist Centre, where the views are as vast as the atmosphere is peaceful, down to the Poqueira River and up to Bubión. Allow longer for a visit to the gardens of the Buddhist Centre and choose a time of day to walk in sun or shade according to the season. Length: 11.5 km, more downhill than uphill. Difficulty: Easyish. The width and quality of the path vary and there comes a moment where it disappears briefly and you have to use your wits. This moment of adventure adds a pinch of spice to a delightful walk. 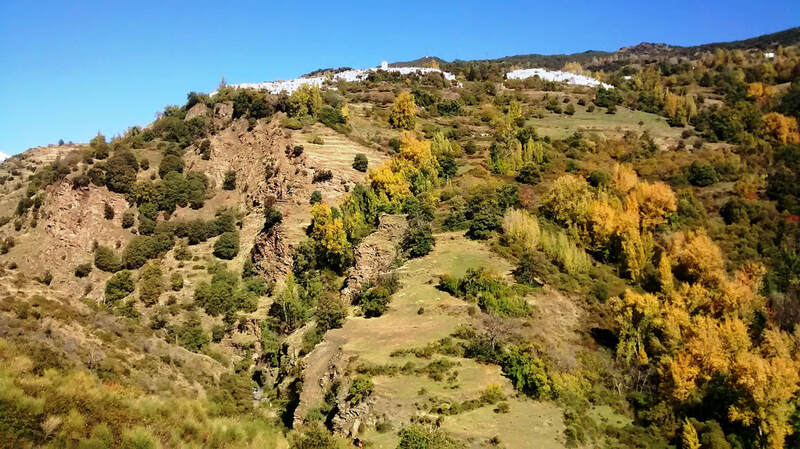 The place of the clear light, as O Sel Ling translates from the Tibetan, is a magical space on the southern end of the mountain ridge opposite the villages of the Poqueira Gorge. It is high and silent and powerfully peaceful, charged with the energy of its entities. 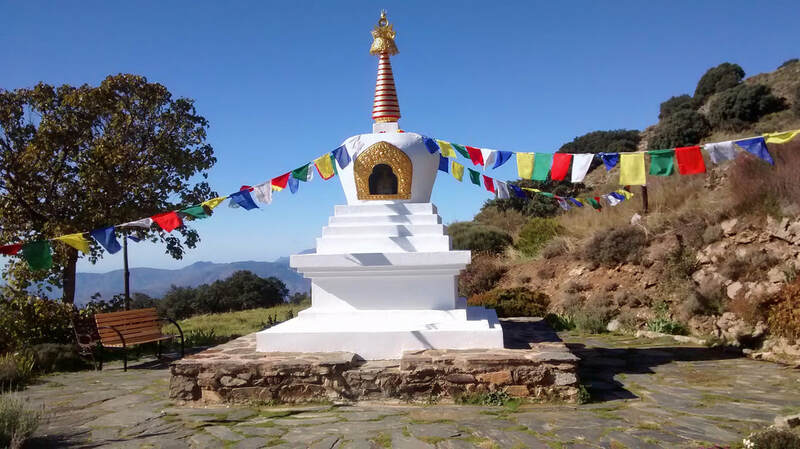 A path through the mountain garden takes you from a massive bronze prayer wheel to a perfectly white stupa. Nearby in a small pagoda is the Buddha of Medicine and higher up, ringed by water, is the magnificent statue of Tara, Mother of all Buddhas, in all her voluptuous generosity. 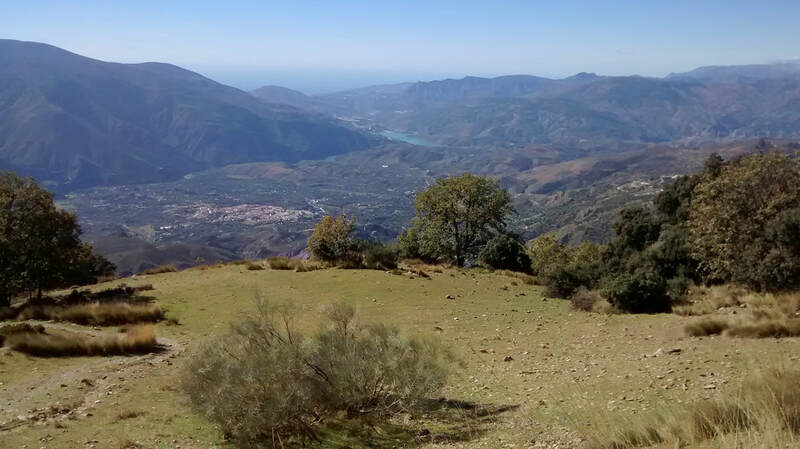 The ridge top location, which locals know as “La Atalaya”, looks out far and wide from this vantage point. At O Sel Ling, while we may wander the gardens at will, it behoves us to respect the stillness of a place where a short distance away people are in silent meditation in retreat huts. Visitors to Buddhist Retreat and Meditation Centre itself are only admitted from July to September: between 5 pm and 7.30 pm; from October to June: between 3.30 pm and 6 pm. The walk described here is a one-way route. 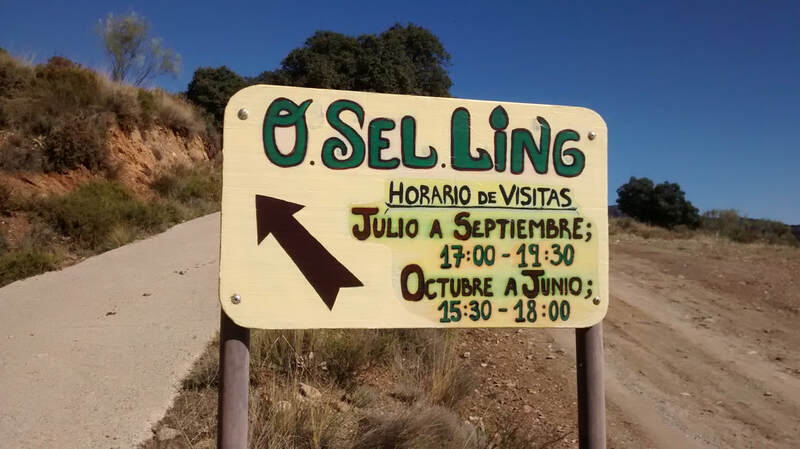 To get to O Sel Ling, which is the setting-out point, you need a friendly person with a car. 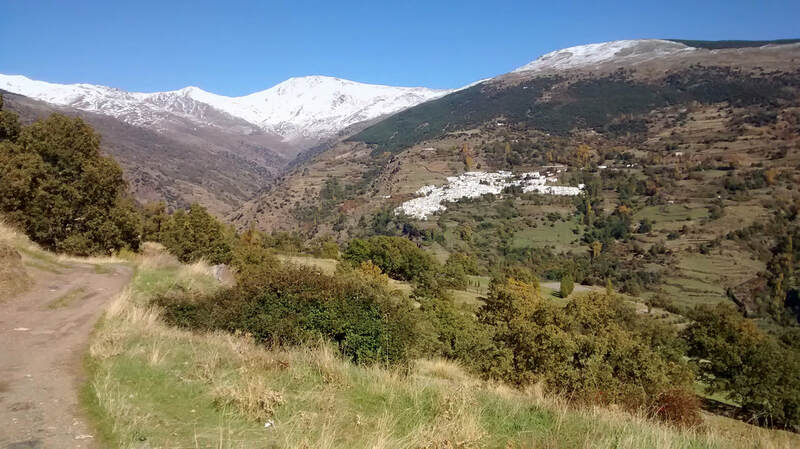 It’s also possible to reach the turn-off to O Sel Ling by taking the Alsa bus, but not only does this bus run very infrequently between Órgiva and the high Alpujarra villages, but from the main road you face a long climb up a rough road to begin with, which kind of defeats the purpose of a chilled-out day. The turn-off for O Sel Ling is from the main A-4132 road above Soportújar. The road, signposted "Camino estrecho" (Narrow track), leads up opposite a tiny chapel marking the boundary of an area known as Padre Eterno. Drive gently when the road changes to a bumpy track. At 1,600 metres, we come to the entrance to the Buddhist Centre. 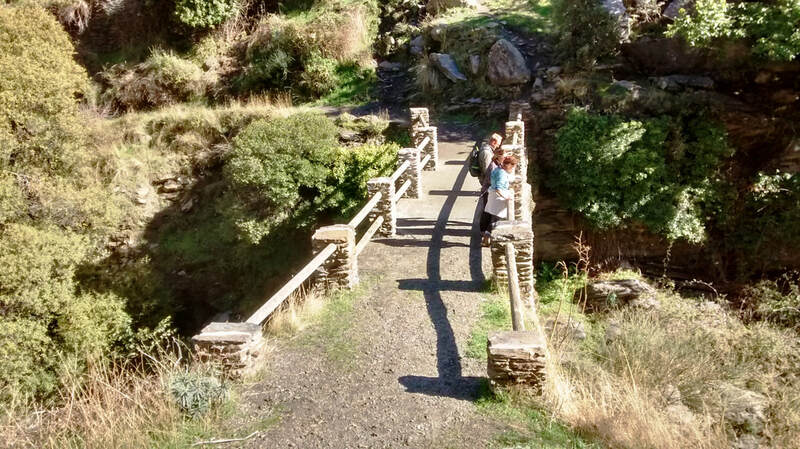 Our walking route starts here: but instead of going left up to O Sel Ling, we follow the track to the right to continue along the side of the Barranco del Poqueira. The track is broad and even as it heads up the Poqueira Gorge. Below, on the other side, are the villages of Pampaneira and Bubión. This track goes on for many kilometres: what you should keep in mind is that your aim is to descend to the river below Bubión. After a while, the track divides. The juncture is marked with nothing more than a plain wooden post, but the track to the right and down is pretty clear: it presents an obvious invitation and you should take it! 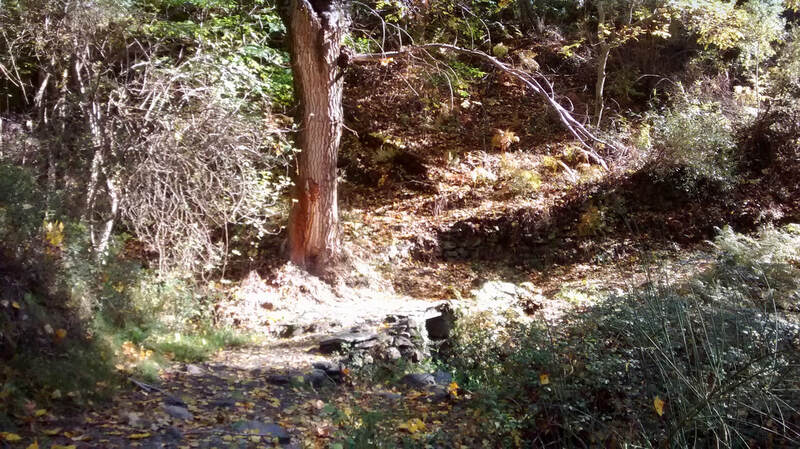 The track is still broad but it becomes wilder. 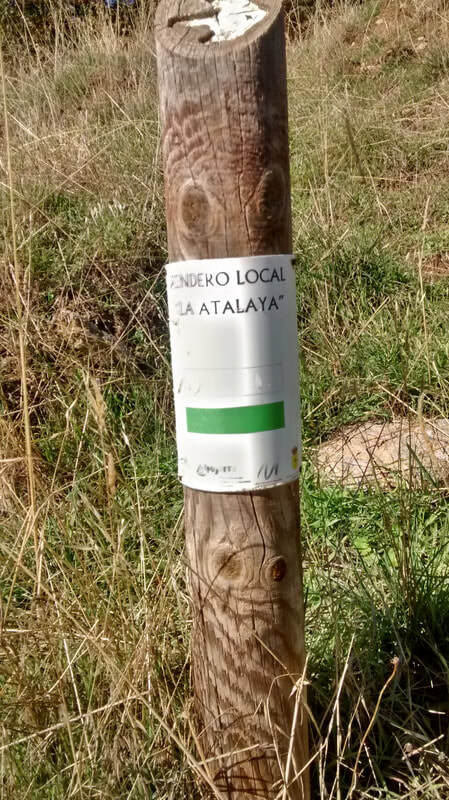 Green-and-white Atalaya waymarkers indicate that you are going the right way. 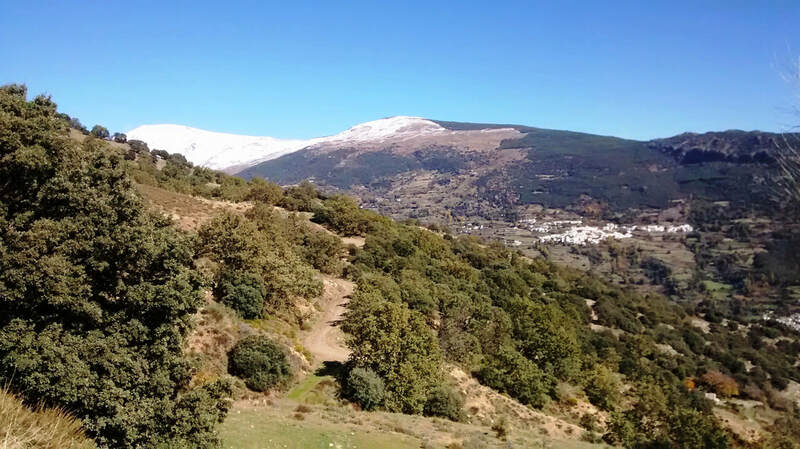 You have a clear view of Capileira and distant Mulhacén mountain, often clad in snow. Eventually you come to what appears to be a dead end at a cortijo with a sign “Final de Sendero”. But directly to the right continues a narrow path, which is indicated by a short post marked green & white and “Atalaya”. Even this, however, peters out quite soon and you then have to “follow your nose,” taking the most obvious or rather only way through an olive orchard, holding branches out of the way. It might look unpromising but keep going and make your way down. It does become a recognizable, if narrow, way down (with a barranco just to the right) and not before long it meets a proper path, where you turn left to begin the descent to the river. Where the path divides, a sign offering a route to "Capileira 3.2 km", ignore it and continue down. Now well below Capileira, you hear the river before you see it. Where to have drinks and food afterwards? Read our local guide to the bars and restaurants of Bubión and Capileira. 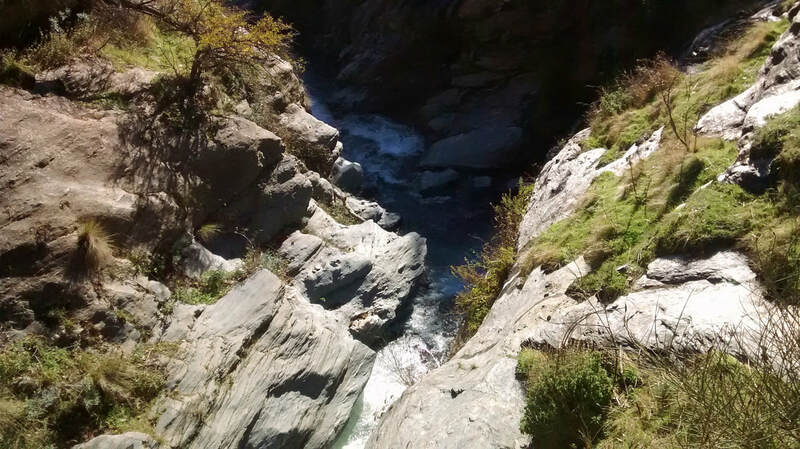 Cross over the Poqueira River at Puente Molino and start the steady climb up. As you ascend on the other side, the way divides: left for Capileira, right for Bubión. 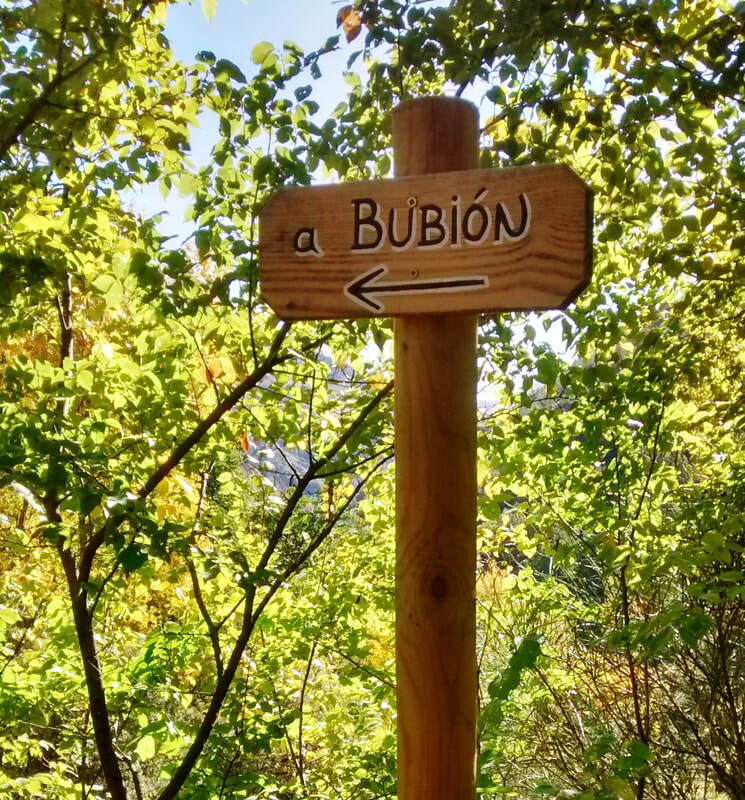 We're going to Bubión, but either way, you can’t get lost from here. After the easy descent, the way up feels something of a challenge, but your reward in the form of food and drink await! The way to Bubión goes past a line of fir trees to enter the village at the sports pitch. As long as you keep going up, any choice of streets takes you up to the main road and the end of the walk, finishing for refreshment and a bite at “El Teide” (except Tuesdays) or “Lo Nuestro” (closed occasionally). From Bubión you can look up and see the gleam of one of the white towers at O Sel Ling where you started out.